Fast food may seem like a convenient, inexpensive meal option, but it often contains excess calories, fat, salt, refined carbohydrates and cholesterol. Interest has grown in determining the health implications of fast-food consumption. So far, scientists are unable to say unequivocally that fast food causes heart disease. 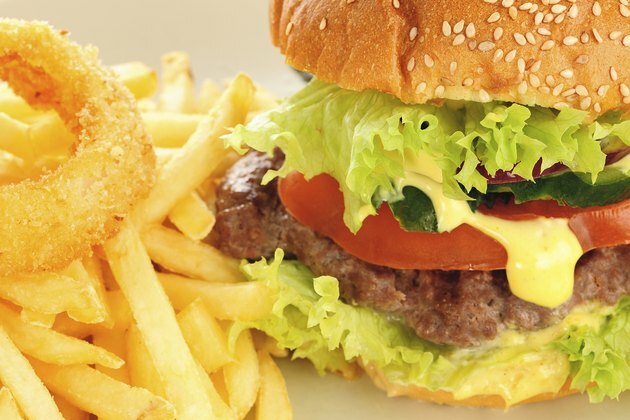 Population studies, however, have identified a link between fast-food consumption and an increased risk of developing or dying from heart disease. University of Minnesota School of Public Health researchers examined the eating habits of adults living in Singapore to determine the health risks of eating Western-style fast food. The study found that consuming fast food as little as once a week increases the risk of dying from coronary heart disease by 20 percent. The risk goes up to 50 percent if you eat fast food two to three times weekly, according to the study. Worse still, the risk shoots to 80 percent for those who eat fast food four or more times per week. Researchers published the results in the July 2012 issue of the journal "Circulation." Eating fast food can increase your intake of calories, total fat, saturated fat, cholesterol and sodium, plus sugar from soft drinks, according to a study published in the June 2012 issue of the journal "Archives of Iranian Medicine." Eating too much of any of these can alter metabolic factors that increase your risk for heart disease. Researchers studied young and middle-aged fast-food eaters and found both age groups showed an increase in heart-disease risk factors, such as increased body mass index and waist circumference, high triglycerides and low levels of high-density lipoprotein -- a form of good cholesterol. The primary concern surrounding fast-food consumption is that it can provide an imbalanced amount of macronutrients. For example, consuming too much sugar can cause obesity. The risk of heart disease goes up as your weight and waist circumference increase. Eating too much salt raises blood pressure, another risk factor for heart disease. Regularly consuming excess saturated fat raises the level of cholesterol in your blood, a major risk factor for cardiovascular disease and stroke. How often you eat fast food -- and the items you choose when you do -- plays a central role in the impact it has on your health. When you do order fast food, check the menu for healthier options such as grilled chicken instead of fried or breaded. Order a salad, but skip components such as bacon bits, cheese and regular salad dressing. Choose the smallest serving size available, and if it appears large, divide the portion in half. Many restaurants now include nutritional information, which can help you choose healthier options.